Day 1: Friday, March 1 Fly down to Guatemala City and get picked up for your overnight at a B & B 5 minutes from the Guat City airport. Meet the other travelers, relax and have dinner. After breakfast at the hotel, you will be picked up by private van and driven to Santiago Atitlan, in the Western Highlands of Guatemala. Your first stop is the famous Museo Ixchel del Traje Indigena (textile museum) to orient you to what you will see over the course of our week. During your drive, out of the city you will see traditional Maya dressed in their “indigenous ropa” (traditional clothing) and small farms scattered over the hillsides. 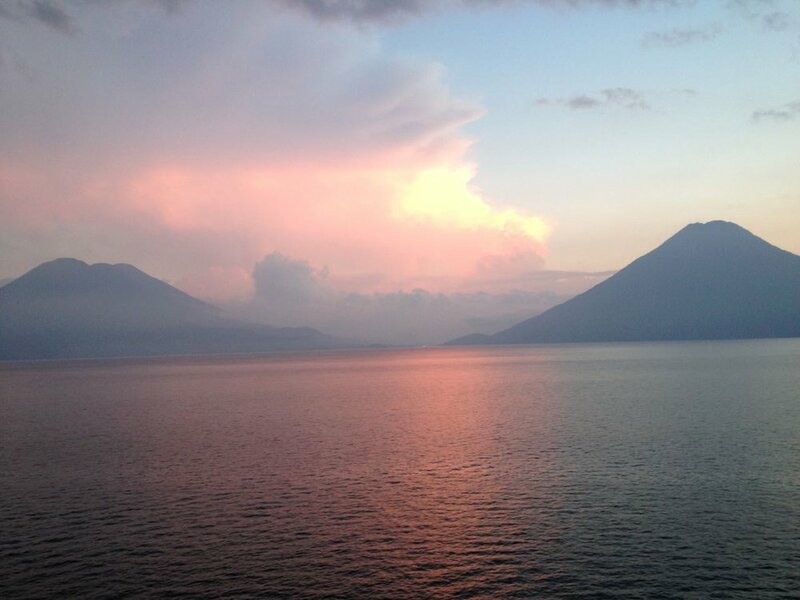 Arrive at the Posada de Santiago- built on the edge of Lake Atitlan. Unpack and check out this wonderful and friendly hotel. We will be joined by our Mayan guide, Dolores Ratzan Pablo, for a walking/tuk-tuk/truck tour of Santiago. We will visit the Peace Park, the historical Santiago church, the home of a corte (skirt) foot-loom weaver and his family, the Santiago crafts market and Maximón- a Mayan deity. Ride around town in a local pick-up truck! Travel by small launch to San Juan de Atitlan- a small Lakeside pueblo that specializes in natural dyeing. Tour the weaving cooperative and artist galleries of this special Mayan village. We will be back to the Posada in time for you to schedule a massage, sit by the lake pool, take a hot tub or return to the market. Dinner: The Posada de Santiago. After an early breakfast, we will take our launcha boat across Lake Atitlan to Panajachel. We check into our hotel and go to the indigenous textile flea market textiles. This is one of our favorite places to shop. Antique huipils, cortes, fajas. Then we travel up the hill to Solola to visit a weaving cooperative. We are greeted by our good friends, the weavers of Asociacion Maya de Desarrollo. Enjoy a guided tour of the production and dying process. Free afternoon to explore. After breakfast, we make our way to the Multicolores offices to hear about rug hooking projects and their social action programs. You will have the opportunity to purchase some gorgeous, hand made rugs! With our private driver, we are taken around Lake Atitlan to San Antonio Palopo- a small village that specializes in foot loom woven fabrics. We have a special lunch in Santa Catarina overlooking the pool and lake. Santa Catarina is famous for the murals of indigenous patterns painted on the walls of the houses. Return to Panajachel mid afternoon with time before dinner to shop the market, hike in the Natura Preserve, go to an archeology museum or relax poolside. Your final day before traveling home is a free day to explore the local markets, galleries, cafes and sights of this beautiful city. The former colonial capital of Guatemala holds much history and culture. Elizabeth Bell leads an optional historical walking tour of the city 9:30-12:30, for those interested. (Cost $25). Depending on your travel plans, you are picked up by private van and escorted to the Guatemala City airport for our trip home. NOTE: Itinerary subject to change at tour leader’s discretion.